Do you know when a touch up painting is good enough or when you should repaint all together. Many wonder why they can’t just touch up the painted walls they scuffed up with just a paint brush or finger dipped into the paint can. Chip in the wall? 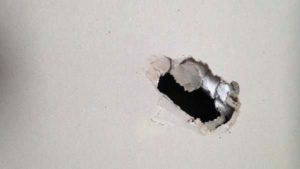 Hole in the ceiling, or has the stipple come off due to a leak or water damage, scuff mark from shoes or moving furniture are all ways of getting out the old leftover paint to touch up. Perhaps you’ve just moved in to your new house and either yourself or the movers have made scratch marks or scuff marks with some of the furniture. Since the paint job is most likely fresh because you just had the whole interior of your house painted before you moved in, then this could be an easy fix with either a q-tip if it’s small nicks or scuffs, or you may need to take out the paint brush and use that to cover the small imperfections. You won’t notice any change in the colour of the paint because it’s still fresh and not years old where you would see the difference in the shade. Variations occur in the paint colour after a few years because the original pigmentation changes. It’s just a normal process just like we age so too does paint. So you push through your front door one night coming home from work and the door knob hits the wall. It unfortunately creates a hole in the wall. This now has to have the small area of the drywall repaired and then if it’s just a small hole and the paint job is fresh by like a couple of months or so then sure you might be able to get away with just a touch up painting to conceal that hole behind the door. Next time your at a hardware or department store look for one of those door stopping thingy’s. They’ll help provide the stop point for not letting the door knob go through the wall next time, in fact never again. Because that area in the drywall now has to be repaired by either patching or replacing the drywall, taping, mudding/plastering then sanding it, paint primer and then paint the colour. If you are going to be painting using the same colour on the walls you will most likely notice a change in the area. You’ll see the difference between the old and new paint. This area of the wall may need to be completed repainted at this point. Calling on a professional house painting contractor in Ottawa can help ease the stress and give you that perfect finish again. All of the above apply to your ceilings, cove, trim and baseboards along with the walls. Say for example the toilet in the bathroom leaked and the water damaged the ceiling in the room right beneath it. Sometimes if it’s caught in time and hasn’t spread into a huge patch then a simple touch up paint job is possible. Of course PG PAINT & DESIGN would ensure the proper product is used to cover the water stain and repair the ceiling before any repainting or touch up is done. If you’ve nicked the exterior paint on the front door to your house, it’s not always a quick patch up paint job. You will be able to see the difference in the paint colour shade between the old and the fresh coat of paint being applied for the quick fix. Now, you may be asking yourself, “But what if I get a colour match and a brand new can of paint?” That’s definitely a better option than using old paint. But the fact is that even if you use the latest paint-matching technology, the paint sheen will be off, making your touch-up stand out just as much or as badly as if it was a different color. 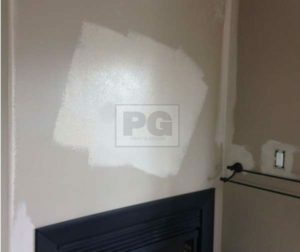 A true professional painter will always recommend what’s best for the situation, and the best way to do it is to assess the damage, give you a full explanation to what can or cannot be repaired and be able to provide you with a complete step by step process and why they choose to go that route. It’s not always because the painter is trying to pull the wool over your eyes 🙂 but more often than not they are providing their expert opinion and years of experience so that in the end you have the best quality workmanship and painting results and the happy and satisfied customer experience. See our testimonials. As time passes your walls, the ceilings, the trim and baseboards have all been exposed to sunlight, flourescent lights and just the everyday things we do in our homes like cook, shower and live there. Over time the paint’s original pigmentation mix changes. It loses some of it’s original power because everything ages. So instead of stressing over why the paint colour doesn’t match the touch up painting you tried to do and now you are frustrated that you have to repaint the entire room or area, stress no more. We invite you to join our Social Pages like Facebook, Twitter, Pinterest, Google+ and Houzz for more pictures, inspiration and ideas for home decor and house painting tips. 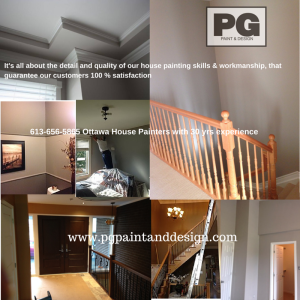 Book your free painting estimate with us!